How do those new scanners at airports work? There are two main types of these scanners: one uses radio waves to generate a three-dimensional image of what’s underneath a person’s clothes, while the other uses low-intensity X-rays to generate a two-dimensional image. Both of these techniques rely on measuring the radiation that is scattered back off of one’s body to generate an image. The purpose of these scanners is to look for basically the same things a security officer would look for in a pat-down: weapons, explosive devices, or anything else someone is trying to hide. 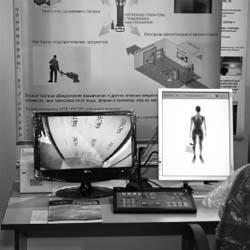 Airport scanners work by using radiation to see under clothing, whether it is X-ray or radio-wave radiation. The levels of radiation are kept low enough to be safe.